Traditional dental examinations provide valuable diagnostic information about the state of your oral health. Dental radiographs, or X-rays, complete this picture, providing dentists with images of the underlying structures of your smile. 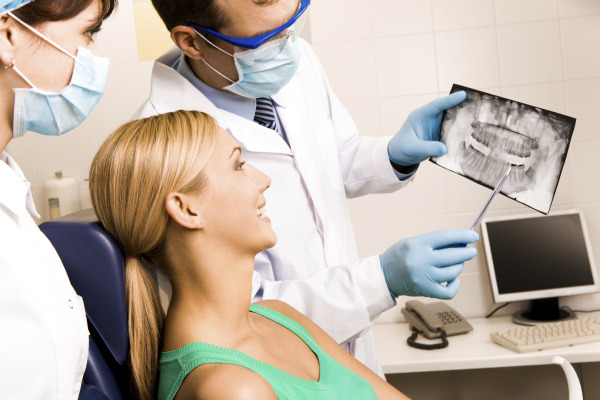 With dental X-rays we can personalize treatment plans to address all of your dental concerns. At Frost Dental Group, we strongly advocate the use of dental radiography to detect abnormalities that are not easily spotted with a visual examination alone. Left untreated, small dental problems can develop into complex issues. Early detection allows Dr. Lee Frost to recommend a variety of conservative treatments that are catered to your comfort and budget. In keeping with our commitment to patient health and safety, our team is dedicated to minimizing radiation exposure during dental X-rays. Our Rutherford dentists protect patients’ bodies from excess radiation with lead apron shields. We also use modern, quick processing film that speeds up the imaging process, cutting down exposure time while collecting accurate, comprehensive images. Dr. Frost will take your medical and dental history into account, along with findings from your oral examination. We also consider the presence of any symptoms, age, and risk factors for disease to decide on an appropriate amount of dental radiography. Dental X-rays help our doctor and team provide comprehensive dental services. For more information about general and preventive dentistry in Rutherford, reach out to us today!